The last few weeks, Exit has been reporting about the plans to destroy the monumental National Theater complex, privatize the public land in the middle of Tirana through a concession, and hand it over to government darling Fusha shpk to build an “urban arcade,” in other words, another shopping mall with apartments on top. The new National Theater, unveiled by Prime Minister Edi Rama himself, would be designed by Danish architecture firm BIG of architect Bjarke Ingels. 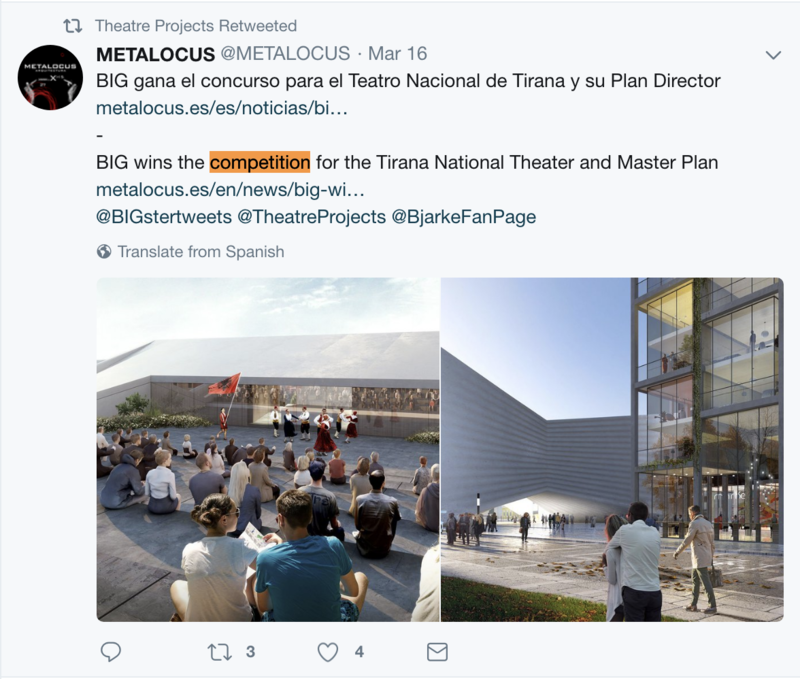 In several public announcements, BIG is claimed to have won a “competition for the Tirana National Theater and Master Plan,” for example in an article in Spanish architecture magazine Metalocus, retweeted by Theatre Projects, which collaborated with BIG on the proposal. 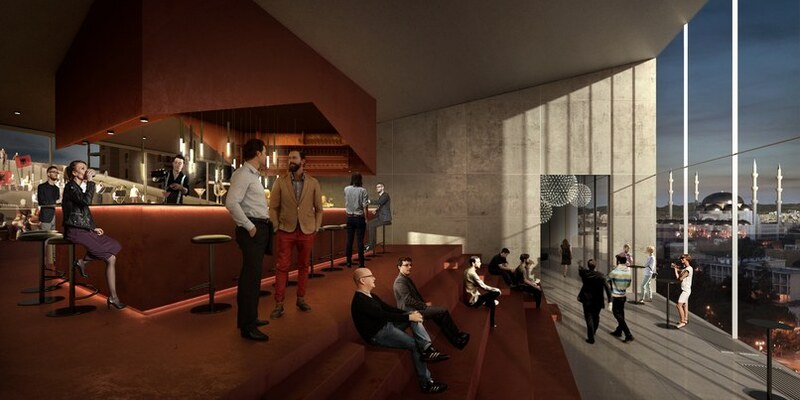 – In several news items regarding the new project, it is said that BIG was “selected” to build the new National Theater. Who did the selection, the government or a private company? Was there a public competition that you won? – It is stated that your client is Fusha shpk and not the Albanian government. Has Fusha informed you that the project is built on public land? – Are you aware of the fact that the government is intending to pass a “special law” to privatize the public land on which the National Theater, allowing Fusha to construct without the necessity of a public procurement procedure? – Are you aware that the government has called the project a public–private partnership (or concession), a questionable form of financing recently denounced by the IMF in Albania as a threat to the Albanian economy? – Are you aware of the close links between Fusha shpk and the Albanian government, and the fact that it has won several large construction tenders in dubious and possibly fraudulent public procurement procedures? – Will you also be responsible for the design of the “urban arcade” behind the National Theater building that is featured on several of the renderings? – Is BIG aware of the protests held by actors from the National Theater against the destruction of their historic building and the privatization of the land? – Does BIG support the privatization of public lands to profit large development firms close to the government? We are not dodging your questions or deferring responsibility, but given the magnitude and importance of this project, it would be highly unusual to not have a contractual agreement with our client about speaking publicly. I have copied Erka [Mato] from the Mayor’s office to this email who is more than happy to answer competition related questions. 2) The Municipality of Tirana is indeed the client of BIG, which means that the mention of Fusha shpk as main client online is not true. If Fusha were the real client, there would be no reason to divert questions to the Municipality. 3) There was indeed a “competition” for the National Theater, a competition which however has been held in complete secrecy and was anything but public. Moreover, the failure to inform to citizens of Tirana about this project and organize public hearings both violates the Law on Notification and Public Consultation and the Aarhus Convention. Subsequently, we sent a number of questions related to the “competition” to Erka Mato, who in turn forwarded them to Renato Kalemi, Media and Communications Advisor to the Mayor and Denis Dedej, Director of Information, even though Pahhota claimed she would be “more than happy” to answer questions. In spite of several follow-up emails to both BIG and the Tirana Municipality, so far no one has responded. Perhaps “given the magnitude and importance of this project,” no one knows what they are doing?